Statewide assessment is just one measure of student success, but its unique strengths include objectivity; results that can be compared across students, schools, and the state; and an annual learning growth measure for every student in grades 3-11. Statewide assessment tells teachers and parents whether a student is meeting the learning expectations for a grade and subject and is gaining the real-world skills – reading, writing, analysis, and problem-solving – demanded for postsecondary learning and work. As professionals, teachers seek to continually improve their instruction, relying on data from a statewide assessment aligned to the state’s academic standards to understand the impact of their instruction on student learning. These data are integral to the multi-measure annual evaluations that teachers report are helping to improve their teaching and positively impacting student . Statewide assessment helps educators determine the support students need to learn at their highest levels such as interventions for struggling students and new opportunities, like accelerated classwork, for high-achieving students. Statewide assessment helps all Tennesseans understand the gaps in learning and achievement for different groups of students and helps focus support for historically underserved students. 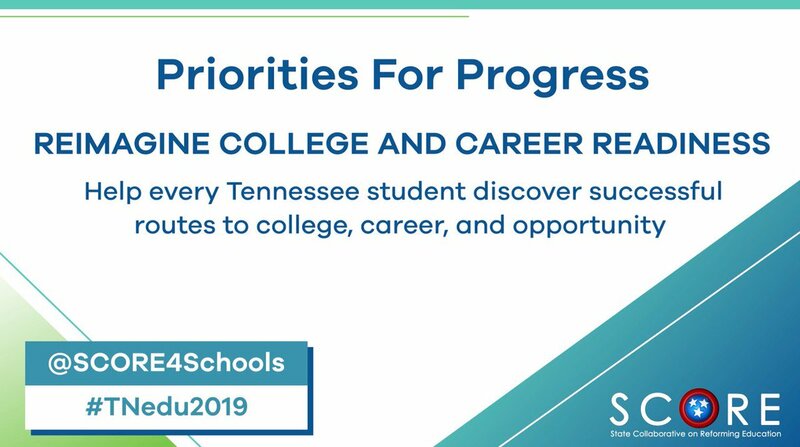 In short, statewide assessment results inform the decisions teachers, policymakers, and parents make to help prepare all Tennessee students to graduate ready for success. Although millions of TNReady test sessions were successfully completed this spring, the widespread technical difficulties were undeniably disruptive and frustrating. Our students and educators deserve better. 1. Continue Tennessee’s academic progress by giving students and teachers a statewide assessment with high-quality content and best-in-the-nation administration. TNReady test items offer a high-quality measurement of student learning that tracks with results from the Nation’s Report Card and ACT while giving teachers specific, actionable, and timely data to improve instruction. We now must ensure seamless administration of TNReady. 2. Provide actionable results every year so the state’s school accountability system can be used to ensure all students are receiving a quality education and ensure any schools that are not making progress receive the right intervention. 3. Give teachers data they can use to refine their instruction and help all students learn at their highest levels. A sustained, strong commitment to incorporating student assessment data into annual teacher evaluations also is important because of the positive impact on teaching and learning. 4. Stabilize and expand online testing so students have a fair chance to show what they know and can do. Online testing delivers faster data to educators and helps students be ready to meet post-graduation expectations for doing their work on a computer. It will take all the above – and likely more – to rebuild confidence in Tennessee’s state assessment. TNReady cannot succeed if it is not trusted, and it will not be trusted until it is administered reliably. As Tennesseans, we should work together to make all necessary changes to deliver a statewide assessment that is worthy of our students and teachers and works next year and every year.